The app opportunity is global, and certain industries are definitely leading conversion in terms of mobile commerce growth. Retail and travel industries are seeing app conversion rates over four and three times the conversion rates seen on mobile web, respectively. Shoppers have their phones on them all the time. While many people are more open to buying on their mobile devices, our latest research found that mobile commerce growth is actually dependent on format, too. Our Global Commerce Review found that in Europe, for example, 63% of mobile commerce* happens in-app. In the United States and Asia Pacific, that number reaches as high as 71% and 70%, respectively. Retail advertisers with a shopping app and mobile web fully implemented saw 4% conversion rates on mobile web and 18% conversion rates on their apps. 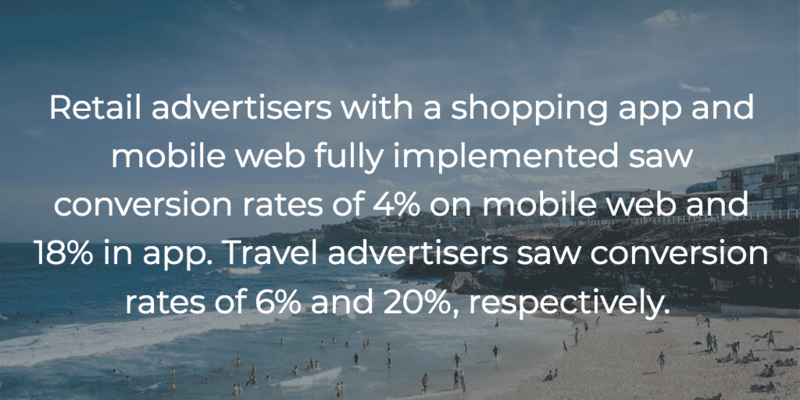 For travel advertisers, mobile web conversion rates* were 6% while in-app conversion rates are as high as 20%. It’s time to shine for travel booking apps especially, with travel companies launching travel booking apps for every kind of trip from vegan restaurant locators to Tinder-like apps for matching travelers with suitable hotels. Whether people are booking long vacations or just a day trip, they’re doing it on mobile apps, where acquisition costs are low and engagement as well as loyalty are high. According to the J.D. Power 2017 North America Hotel Guest Satisfaction Index Study, hotel mobile app usage for booking is associated with higher guest satisfaction and increases the likelihood of a happy guest sharing positive reviews on social media. And with Google finding last-minute travel search terms like “today” and “tonight” increasing 150% in the last two years, easy-to-use and benefits-laden travel booking apps are bound to be a traveler’s best friend. What’s clear is marketers who don’t have an app should focus on building one, and for those with an app, making sure it’s fully optimized to provide a seamless shopping or traveling experience is key to harnessing existing intent. Mobile retargeting ads can help you help build a cross-device journey for shoppers that are anything but predictable. Shoppers might download an app once and never visit again, but with retargeting, you can re-engage those shoppers with a personalized recommendation. If executed properly, a mobile retargeting strategy can help you reach more shoppers on their devices, no matter where they are and bring them back to make a purchase. After all, if a customer has gone through the trouble of downloading your app, they’re probably looking for something they want.